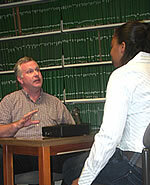 The UNT Oral History Program is a longstanding research initiative of the University of North Texas. Housed at Willis Library on UNT’s main campus in Denton, Texas, the Program is affiliated with the UNT Department of History and supported by the UNT College of Arts and Sciences and UNT Libraries. The Program records, transcribes, and archives oral history interviews covering a wide variety of subject matter in order to preserve local, state, and U.S. history. The Program trains UNT students in the theory and methods of oral history and conducts workshops for members of the larger community who are interested in preserving their own histories. We also have ongoing partnerships with local history societies and historical museums, local, state and national agencies, fellow colleges and universities, and many other community organizations that share our mission. Nearly all interview recordings are transcribed. The transcripts are edited, bound, and archived in Willis Library, where they are available to scholarly researchers and members of the general public through UNT Special Collections. Please visit our Collection page for additional information on individual interviews, collections, and ways to access the collection. The strengths of the collection include (but are not limited to) World War II history, with a collection of over 1,000 interviews with WWII veterans; Texas political history; Texas business history; history of the New Deal in Texas; civil rights history; and immigration history. Your donations help to make our work possible.